NEW YORK (Reuters) - President Donald Trump's personal lawyer Rudy Giuliani on Saturday said that U.S. sanctions on Iran are leading to economic pain that could lead to a "successful revolution," contrasting with administration comments that government change in Tehran is not U.S. policy. 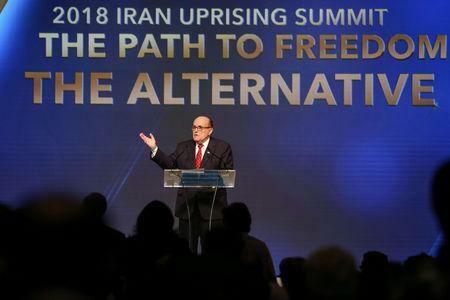 "I don't know when we're going to overthrow them," said Giuliani, who spoke in his own capacity though he is a Trump ally, at an Iran Uprising Summit held by the Organization of Iranian-American Communities, which opposes Tehran's government. "It could be in a few days, months, a couple of years. But it's going to happen," Giuliani told a crowd at a hotel in Times Square. Giuliani's comments were in contrast with the Trump administration's policy of not seeking a change of government even though it is reimposing sanctions that are crippling Iran's economy. Trump ripped up a global deal on Iran's nuclear program in May and his administration is snapping back sanctions on the Islamic Republic, including measures on its oil exports from Nov. 4. Giuliani has suggested before that the re-imposition of sanctions was aimed at regime change. At a conference in June where he addressed the Paris-based National Council of Resistance of Iran, he said Trump's policy would suffocate Iran's ayatollahs.